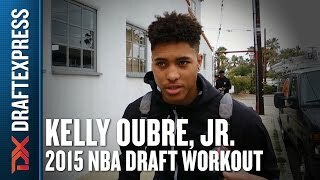 An interview with Kansas's Kelly Oubre, featuring footage from his pre-draft workouts in Santa Barbara and his athletic performance work with P3 Sports Science. Discussing a variety of topics with Kelly Oubre in Santa Barbara, including what he's working on on and off the court, his time at Kansas, and how he's looking forward toward the pre-draft process. DraftExpress was once again in Chicago at the McDonald's All-American dunk contest, filming every dunk with our exclusive slow-motion technology, lovingly dubbed DX-Mo. See what Kelly Oubre had to offer.